Fire Mountain. Of The Dust. There’s certainly a thing right now for backwoods type folky music topped off with earnest vocals and harmony singing very much in evidence. Think of Fleet Foxes, Midlake or even Bon Iver and add Fire Mountain to the list. Hailing from Troy, Alabama they’ve enlisted the talents of Arthur Alligood (himself a fine purveyor of introspective Americana folk songs) as a producer and recorded this, their second E. P. in Nashville. With a fairly basic line up of acoustic and electric guitars, piano, bass and drums they manage to conjure up a wonderful sound that is crystal clear and at times sounds as if it was carved from nature. There’s a rarefied air to the songs as if they were being played in a forest clearing with the rippling piano recalling mountain streams. Perry Brown’s plaintive voice sings of fear and regret, of a child’s fear of darkness and the finality of death. Overall there’s an existential angst, a loneliness best expressed in No One’s Help. While Brown is the frontman for the band mention must be made of the excellent piano playing of Bryan Segraves throughout while Aaron Newberry adds some fine electric guitar especially on the dynamic opening song Black Heart and Torch. While Black Heart with its grim splendour might be the song that gathers most mentions Torch is the standout song. A simple tale of alienation which relates how the child fathers the man the band play delicately with piano and guitar creating a chilly frisson. Excellent stuff. North Carolina musician Michael Rank has been knocking about for the past 20 years with his band Snatches of Pink, a band much in thrall to the likes of Nikki Sudden, Johnny thunders and Keith Richards. This solo effort sees him backed by members of the band along with several other North Carolina luminaries from bands such as Trailer Bride, Patty Hurst Shifter and Chatham County Line. It’s been five years since he’s recorded and in that time he fathered a son only to have his partner leave him and some of this is reflected here, which might bode well for those who see “break up” albums as a surefire way to call up the muse. Describing his new outfit as “the illegitimate son of rock and roll casualties Snatches of Pink” Rank also calls them the “acoustic arm of the scarecrow,” presumably to differentiate this line up from the gutter glitter image and sound of the earlier band and while its true that fiddles fly and acoustic guitar predominates there’s plenty of electric bursts and buzzes that spark and burn on what is a set of wonderfully ramshackle country leaning rock songs. The opening country thrash of Tenderhook doesn’t really prepare the listener for the majesty of On The Bleed, a ballad straight from the Stones’ country songbook with keening pedal steel and curling guitars winding in and around Rank’s strained and wearied vocals, tremendous stuff. The Goat is another Stones like cut with some stately piano playing adding a degree of faded grandeur to it. The country honk of Straw Man starts off as a fine fiddle and mandolin laced stomp, a hillbilly Son Volt almost but towards the end Rank launches into an audacious ragged glory of a guitar solo that tears the song to shreds and leaves the listener beaten into submission. Underneath the angst and chaos Rank does write some beautiful songs here with Tongue, another song in the late sixties Stones decadent style standing out while Arrowheads is a heartfelt plea regarding his failed relationship. His guitar work at times ranks with Neil Young for angry and massive slices of noise such as when he lets rip towards the end of Manservant. This is not an album for anyone who wants to hear polished and tidy country rock. Several of the songs are almost like a visceral assault on the ears, Gun Breaths has Stag’s pained voice howling over swathes of guitar and piano while the closer Here Comes The Light ramps this up to the nth degree. Some of the lyrics are close to the bone as Rank examines what went wrong but overall it’s a brave and naked attempt to wrest some sense from his life. To his and the musicians’ credit they deliver in spades with what is one of the most invigorating albums we’ve heard this year. We’ve mentioned Hillfolk Noir before with their fine fly on the wall recording Skinny Mammy’s Revenge. A companion album recorded live at the Old Idaho Penitentiary was even better with the Boise, Idaho combo letting loose on a bunch of exhilarating stringband/jugband/old time songs. Now, according to their website, we have a name for their particular way with a tune, Junkerdash. Junkerwhat? Well they say that Junkerdash has “multiple definitions up to and including “psychedelic swamp-shack rags.”” So that’s that settled, who are we to argue? 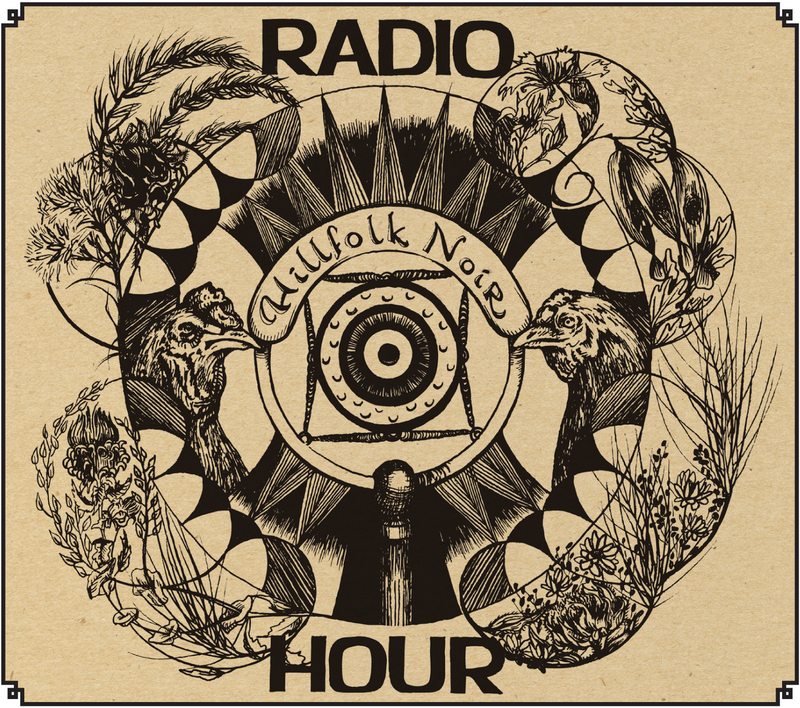 Spreading Junkerdash across the airwaves then this latest release comes in the guise of an old time radio show from the forties the likes of which were beamed across the South and Midwest allowing folk to listen to their musical heroes. A nice concept and the album opens with some waveband search sound effects before settling on the Hillfolk Noir station. The band add a commercial for Hillfolk Wild Root Cream Oil which surely would have Ulysses Everett McGill forsake his “Dapper Dan” pomade. Aside from the old time radio show idea the meat and potatoes on here are the songs, all written by mainman Travis Ward and all of them excellent with not one clunker in sight. Ward writes on topics and themes that are so well worn and familiar as to be past bothering about and it’s a measure of his skills that he can breathe new life into them. The instrumentals are infectious and lively with a large dose of humour thrown in such as on the brief Pig Town Jug Blues where it sounds as if the kazoo player has forgotten the kazoo while Rattler In The Outhouse would have the dead tap their feet. He can be deliciously goofy and romantic as on Hand In Hand or channel Dylan’s Subterranean Homesick Blues as if it were being performed by a coked up Hank Williams on Trash Can. Working here as a five piece the band employ the the expected guitar, banjo, washboard and percussion along with“Tooth Knuckle,” “Coot Hooter” and “Clanker.” The playing is excellent with Ballad of a Lonely Rounder standing out with its singing saw and syncopated rhythym. Stacey Earle and Mark Stuart. Dedication. 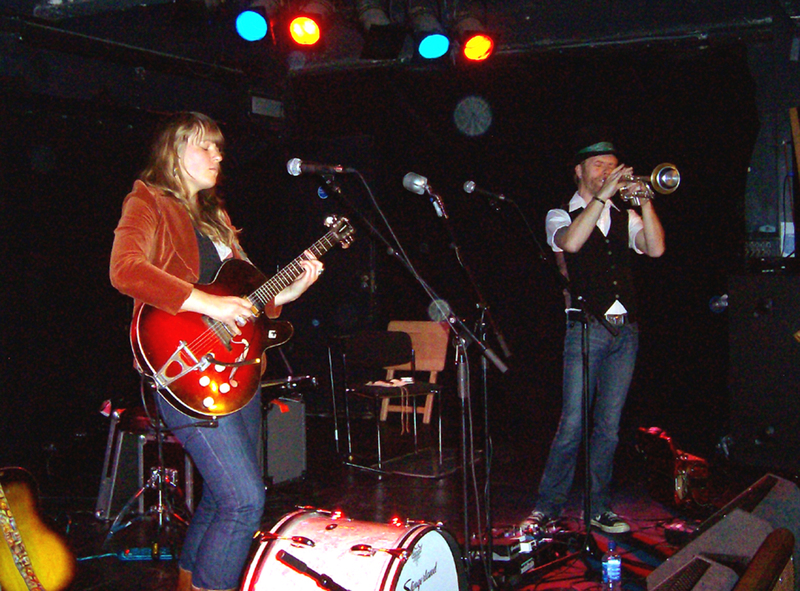 Currently in the midst of a European/UK tour that sees them playing around 50 gigs in about 60 days Stacey Earle and Mark Stuart have built up a reputation as hard working, hard travelling troubadours who will play almost anywhere anytime. Most recently they pitched up at the Rio Café in Partick and will be returning to the west coast later this month. A timely release then for Dedication. It’s a laid back affair for the most part perfectly suited for the pair to perform live although here the songs are embellished by some fine playing from the duo with Stuart playing various guitars and bass, Earle on guitar, piano and ukulele and Craig Wright on drums. Although they say that many of the songs were inspired and written on a 1928 piano gifted to them the piano is not the dominant instrument here, instead the musical highlight is the guitar playing of Stuart be it the subtle Duane Eddy undertones of the title song, the sly slide work on Workin’ On It or the fifties styled almost pizzicato picking that underpins I’ve Been Wrong, I’ve Been Right which also features a fine Sleepwalking type solo. The aforementioned piano is at the heart of the tremendous ballad For A Long Time which was co-written with the late Harley Allen. Bereavement, although not mentioned specifically appears to feature throughout the album with mention of a period of loss and reflection in the promotional notes and the album ends with a short instrumental A Great Day To Fly performed by Earle playing her late father’s ukulele. Bereavement is at the heart of the centrepiece of the album. The Flag is a spoken word (or song poem) from Earle with simple guitar picking and some atmospheric colour by accordionist Michael Webb which recounts a mother’s tale of her son from birth to school to enlisting to his death. Very simple and very effective it’s chilling and evocative. The gritty duet with some gutsy guitar that is the title song is another gloomy slice of life while the McCartney like Broken Heart For You (which is the other piano driven song here) almost breaks into a sunnier clime on its refrain. The following Working On It allows the players to relax and enjoy a slippery slide driven Southern comfort of a song that recalls early Little Feat while the fifties dappled I’ve Been Wrong, I’ve Been Right harks back to earlier, simpler times. A fine album and certainly a good recommendation to catch any of their upcoming shows. Apologies for the time lag in posting this. Originally intended for another website it got lost in a queue, so here goes………….. This Austin based Canadian due brought their fairly unique blend of Gothic Americana for the first time to Glasgow on a quiet mid week night which might explain the meagre audience numbers but for those who came it was a sublime performance. Topped with a Baron Samedi styled top hat, Dave Quanbury wrung some fine spectral sounds from his guitar while Brandy Zdan proved to have a great voice and was no slouch on guitar and accordion. With additional kick drum and trombone from Quanbury and a mesmerising piece of lap steel playing from Zdan the two man band were able to capture much of the mystery and atmosphere of their most recent album When The Wolves Go Blind. With songs ranging from the tango styled What Do I Know About Love to the Rockabilly Rattle of Ham Radio Blues there was variety in the set but the overall thrust was of a cold darkness with menace in the lyrics and the music. The Master was transformed into a David Lynch dark highway melodrama with both players meshing and mashing the guitar lines, thrilling stuff. Their rendition of Frozen Town, a paean to their hometown of Winnipeg had a wintry lonesome Neil Young feel to it and was the occasion for Zdan to embroider the piece with some fine sonic swoopings on her lap steel before segueing in to Ham radio Blues. The duo showed that they can rival some classic male/female vocal pairings with a rendition of Impatient Love from their Highway Prayer album but they were at their best when Quanbury was teasing out feedback crouched by his speaker while Zdan’s voice commanded attention. She’s a great singer and at times one was reminded of the Cowboy Junkies’ Margo Timmins while listening to her. With some new songs including one called (I think) Blackbird Lips where shards of sound fell from Quanburys’ strings it bodes well for their next recorded outing. Call me short sighted but my idea of Rachel Harrington was of an earnest solo artist who plays folk and bluegrassy songs conjuring up America’s past music traditions. Her album covers portrayed an artist who sounded rural and old timey. The cover of this however is a close up of Harrington with a twinkle in her eye and (forgive me, I’m trying not to be sexist), a “sassy” kind of “come on in and listen to this” attitude. Backed by The Knock Outs, an all female combo, Harrington has made a raunchy country album that one could imagine the likes of Loretta Lynn might produce if she were 50 years younger. Raucous at times with the opening song Makin’ Our House a Honky Tonk diving straight in at the deep end Harrington sounds tough as nails while the band are gutsy and solid. He’s My Man thumps along with a sixties rockabilly pop punch. There’s even a Stones type riff and cowbell drum clatter on Nothin’ To Do But You. Having proved they can rock The Knock Outs and Harrington prove themselves just as capable of capturing the more country side of the fifties and sixties with Love Him Or Leave Him a pedal steel and fiddle driven Nashville coated confection while Wedding Ring Vacation captures the early feminist defiance that was the hallmark of Loretta Lynn. The guys get a look in with Mark Erelli singing a duet with Harrington on the slow country waltz of I’ll show You Mine while the closing song I’d Like To Take This Chance just about sums up the album with its pitch perfect recreation of late sixties/early seventies country pop. A change in direction then for Harrington although as she says “I’m still channelling old writers and singers. It’s just that I moved forward about 40 years.” It’s safe to say that she’s done so with style and with a twinkle in her eye. Woody Pines/The Hot Seats. Glasgow. 29th April. Two great bands playing in two different venues on Sunday night required a modicum of planning however it was a toss of a coin that led me to visit the Woody Pines gig at Lauries Acoustic Music Bar first. This Trongate live music stalwart has changed its name recently and now proudly proclaims itself as Avant Garde. All well and good but this proved problematic for the band who apparently circled the area several times looking for Lauries Bar. Nevertheless by the time they appeared on stage they were unfazed by this slight hiccup and proceeded to turn the venue into a veritable southern roadhouse. The four piece North Virginia band led by the tousle haired Woody (who left his usual headgear to a barman in Ireland) immediately had the crowd going with a vibrant rendition of the traditional Long Gone Lost John before easing into Hank Williams’ Can’t Keep You Off My Mind. With guitarist Lyon Graulty switching between clarinet and some fine slide guitar playing the band slid from New Orleans type vamps to old time country blues with 99 Years a particular delight as Felix Hatfield excelled on the washboard sounding like a full drum kit. Crazy Eyed Woman loped along splendidly and an extended version of Counting Alligators with a spoken rap from Woody recounting a trip along Highway 61 encapsulated their appeal with a tight rhythm and a lot of swing. Sadly the desire to see The Hot Seats led us to leave Woody and his band at half time in order to hoof it on up to The Universal and due to crossing the Glasgow dateline we caught most of their set. Another band who drink from the old time music well The Hot Seats are a (mostly) bearded raggle taggle crew who swap instruments with gay abandon and to great effect. Anyone who’s heard their latest live album would know what to expect but in truth the humour and sheer vibrancy of their set has to be seen live. The first song we caught, Trouble in Mind was a steamroller of banjo, fiddle and guitar flailing away, a great start. In full flight the five-piece band serve up an unplugged wall of sound that can make the hair on the back of the neck stand up. No Plans from their next album was an outstanding example of this, forget the cinematic Soggy Bottom Boys, this is the real deal. Playing tunes by the likes of Gid Tanner’s Skilletlickers and Earl Scruggs there was plenty of bluegrass action and even a turn by Shannon Dunne, an American “flatfooter” who whetted the audience’s appetite for a dance. The sly entendre of Peaches allowed the band to wallow somewhat in a vaudevillian humour fully realised on Soft John Blues, a fabulously louche country slouch that pays tribute to that old viagra. Earlier on Woody Pines had commented on the somewhat cramped confines of his gig lamenting the lack of dancing space. At The Universal there was no such problem and by the closing and rousing Another Day, Another Dollar you couldn’t see the band for the dancers. If this had been a battle of the bands then I’d declare it a draw and the only loser was the reviewer who haplessly missed out on the second set from Woody Pines. It’s safe to say however that both bands are smoking hot and if you get the chance to see one or both then do so.